Many challenges face University City in the coming months and years and this issue highlights some of them. This weekend, the April 2018 newsletter will be distributed by UCCA volunteers to homes in south University City. Additional print copies are available at the University Community Library and the Standley Park Recreation Center, both on Governor Drive. Please note that Libraries will be closed on Friday/Saturday, March 30/31, in observance of Cesar Chavez’s birthday. And the Recreation Center will be closed Friday; open on Saturday and Sunday. Page 1: City of San Diego dismisses planning group’s concerns about the Pure Water pipeline’s proposed route on Genesee. City Council has scheduled a public hearing on the Pure Water pipeline for Tuesday, April 10. The proposed route as well as two alternatives (neither of which was considered by city), are featured on the front page of the newsletter. Please see related report from the planning group (UCPG) on page 12. Page 2: features President Barry Bernstein‘s message to University City. Page 3: features a synopsis of the March UCCA meeting (including Costa Verde revitalization project) and a description of newly formed Town Council Coalition. Page 4: features the recent Senior Scam Stopper seminar at the library, and advice on how to reduce energy use as well as how seniors can get a free smoke alarm. Page 5: includes a message from City Council representative Barbara Bry and County Supervisor Kristen Gaspar. Page 6: highlights free library programming and events at both University City libraries. Page 7: features the 45 year celebration at the library on Governor; Girl Scout Troop 3615 and their Gold award project; the UCHS grad night party; and the Osher Lifelong Learning Institute. Page 8: features parks, recreation center and Swanson pool updates; spring bird walks; Shred-Fest at a new location this year; and community volunteer opportunities at the high school. Page 9: features upcoming performances of Bye-Bye Birdie; the Sights and Sounds Showcase; the Key of She concert; and the brown bag opera Romeo and Juliet; an Costa Verde Center update (refer to related information from UCCA March meeting on page 3). Page 10: features color pictures highlighting UCLL Little League opening day and the Garden Club meetup. Page 11: features color pictures showcasing artists and their utility box art work recently completed on Governor Drive. 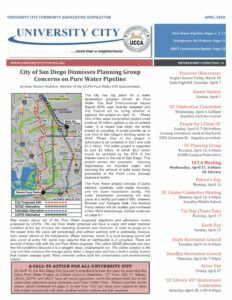 Page 12: features an update on construction projects from SANDAG; and a summary of the UC planning group (UCPG) March meeting. Please see related Pure Water article on the front page. Page 13: features updates about the University City Community Foundation board; UCCA’s support for local businesses; and a warning about aggressive birds in San Clemente canyon. Page 14: is a thank you to all UCCA members and a call-to-action to those who have not yet joined for 2018. Page 15 to 20: features advertising from our local businesses. UCCA thanks our local advertisers because it’s their advertising dollars that pay for the newsletter and make this publication available free to local residents. Help Wanted: Community Contributors! 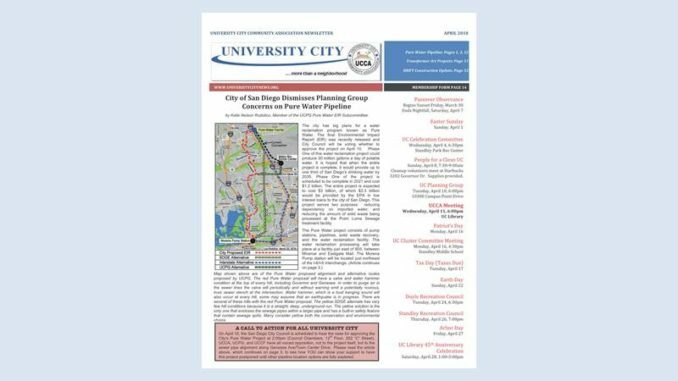 You are welcome to write and submit articles that pertain to the 92122 University City community and residents. Articles should be 250 words or less, text only. Photos must be high resolution JPEG format. Include your complete name, address, phone and email and send to the UC newsletter editor at UccaEditor@gmail.com; or the the Contact Us link https://www.universitycitynews.org/contact-us-or-volunteer-in-uc/. The deadline is usually on or around the 15th of the current month for publication in the following month. The newsletter can fill up before the deadline, so submit early. Submitted items may be published online and/or in the print version of the newsletter. Interested in Advertising in our Newsletter? Visit https://www.universitycitynews.org/advertising-rates/ for details.